WASHINGTON (CNS) — The Advent calendar with one tab or box to open each day for 24 or 25 days taps into something people really like: countdowns. It also highlights the anticipation that is at the heart of the four-week liturgical season of Advent. These calendars, which are religious in nature, hence always with the name Advent, also at times can take the religious theme and run with it, sometimes leaving the biblical manger scene in the dust with daily surprises of anything from whiskey, cosmetics, toys, chocolates, books, coffee, and for pets, daily treats. But not all Advent calendars are alike. Some simply display, when each window is opened, either Christmas symbols, Bible passages or inspirational daily motivations. Some are online, some are traditional paper and others are way more elaborate with daily gifts in drawers or boxes. No matter their size or design, Advent calendars all count down to Christmas. Since they start with the No. 1, for Dec. 1, they technically do not begin at the start of Advent; the first Sunday of Advent varies each year and often comes at the end of November. Some calendars, with 25 windows, end after Advent with the biggest prize, or image, on the 25th window, or Christmas, but some calendars end at 24. Whether they come from a Hallmark store or a religious supply company, these calendars are based on the practice of counting down the days until Christmas that once was done with chalk marks on doors or straw placed in Nativity mangers. The ancient tradition of counting down to Christmas eventually made its way into calendars initially called “Nicholas calendars” because they were distributed Dec. 6, the feast of St. Nicholas, but then the name changed to “Christmas calendars” and even “Advent calendars” as some initial calendars appeared with the annual number of Advent days. 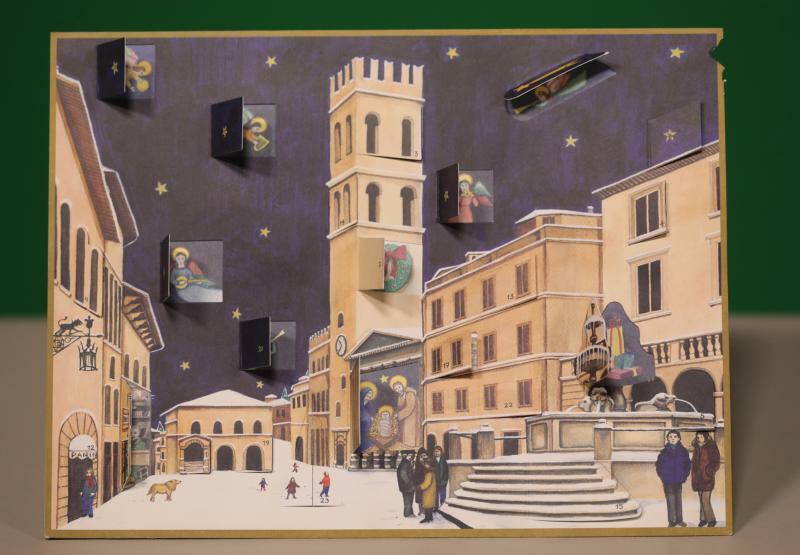 But the first official Advent calendar as we now know it is attributed to Gerhard Lang from Germany who produced a cardboard Advent calendar in 1908 with colored pictures that could be attached to each day in December — replicating the calendar his mother had made when he was a child with 24 candies to stick on cardboard. Lang, who worked for a printing company, further developed this paper calendar to have tabs to open each day of December. Printed Advent calendars took a break during world wars but made their way back to stores and were introduced to American consumers in the 1950s. A Newsweek photo of President Dwight D. Eisenhower and his grandchildren with an Advent calendar in 1953 no doubt gave sales of these calendars a further boost. Today, the Advent calendar runs the gamut from religious to political or sports themes and range from simple to expensive. In 2010, the Daily Mail, a British tabloid, reported on what it said was the world’s most expensive Advent calendar: It was filled with 24 diamonds and gold along with diamond-shaped fairies. The calendar, made by a Belgian company, weighed 81 carats and cost 1.7 million pounds or just under $2.2 million dollars. The world’s largest Advent calendar, according to Guinness World Records, was in London in 2007 at the St. Pancras train station to celebrate the station’s reopening. It stood more than 232 feet high and 75 feet wide. A benefit of current paper Advent calendars is that they can be reused each year — although without surprises under each flap. — Loyola. The site also has a children’s calendar. — The Paulist’s Busted Halo calendar. An unofficial Twitter poll on Advent calendars conducted by this reporter found that 68 percent of respondents viewed Advent calendars as a spiritual resource and 32 percent found them too commercial. One person said she wished religious Advent calendars were easier to find. “I understand of course that this makes it more difficult to have a reusable calendar, but our faith isn’t meant to be reusable. It is to change and grow as we learn and change and grow,” she said in an email to Catholic News Service. Jesuit Father Bruce Morrill, the Edward A. Malloy professor of Catholic studies at Vanderbilt University Divinity School in Nashville, Tennessee, sees something missing with the rush and push to Christmas not only in Advent calendars but celebrations in general, as if Christmas were the finish line. He points out that the church celebration of Christmas really begins on Christmas Day and ends on the feast of the Baptism of Our Lord, which will be Jan. 13, 2019. But ideally, he said, the celebration should continue until Feb. 2, called Candlemas, the feast of the Presentation of Our Lord. Of course that would be an entirely different calendar.